In my last post of this series, I explain how to use message queue of service broker to deliver the tasks to and execute them at conversation target. We did not talk about complex ordering in that scenario. We can also see that the ended conversations stay in the conversation endpoint which will affect the performance of service broker. Ending a conversation with cleanup option can result this issue. It’s not suggested however. In this article, I am going to talk about how to implement complex ordering using Service Broker as a message conveyer and performer but reducing number of conversation handles. The biggest problem showing in last post is that the callers initiate one conversation for each SQL task, as a result, the number of conversations, as many tasks as caller issued, hit the conversation endpoint eventually. That will directly cause performance issue on receiving command. To mitigate the presure of conversation endpoint, we can use one conversation for a series of Tasks invoked by one caller and end the conversation at the end. Alternatively, the conversation can be reused, which will be talked in next post. The design is illustrated below. A list of tasks, where tasks with the same order can be run at the same time, are needed to be scheduled. 2 services are created as a core of the scheduler. The initiator communicate with caller directly sending the tasks to the target as well as receiving messages returned from the target. Now the “physical” infrastructure is created. Caller firstly calls procedure GetScheduler to get a scheduler handle which is a newly created conversation handle. This conversation (scheduler) handle will be used later for all scheduler related activities. Then the tasks which are running at the same time are pushed in to the queue through procedure ExecAsync along with scheduler handle. 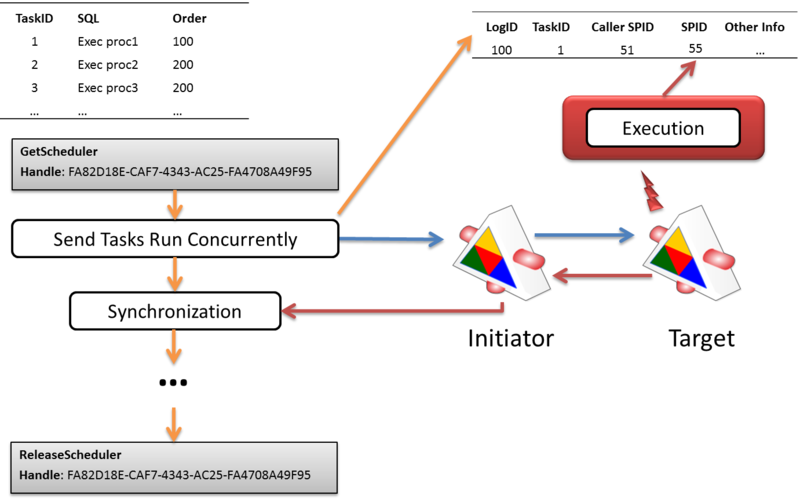 Every invocation of ExecAsync will populate a record in ExecutionLog for logging and monitoring purpose, then, it will send task with LogID as a message to the Target service through Initiator. Once target receives the command, Activation procedure will be executed. It update the ExecutionLog table with start datetime and its SPID, execute the task, update the ExecutionLog with task completion time, and then send AsyncDone message back to Initiator. While one activation procedure is executing one task, more tasks might be sent over for processing. Every completed tasks will send AsyncDone message back to initiator. At initiator side, once the tasks with same order are sent over, caller will call Synchronization process to wait until all sent tasks to complete. This procedure receives one AsyncDone message at once with filter Scheduler (conversation) Handle. If 10 tasks are sent, 10 AsyncDone messages should be received. Once all AsyncDone messages are received, the caller is ready for sending next series of command for execution. At the end, the caller released the scheduler (conversation). --this time is the time when caller sends the task. --When the task is executed, the StartTime will be the time task started. -- this is view we are going to use later to monitor the execution of task series. if @MessageType = 'AsyncSent' -- received MSG is a task! -- This piece of code should not fail. It will show exactly which and where the processes are. We are almost close to the end of this post. What’s your consideration here? My consideration is semaphore control. What if I have 1000 tasks willing to run concurrently but each time only 3 active ones running? This can be overcome by applying semaphore at the caller side, see my post before. Well, if my max queue reader is 5, but I have 6 schedulers sending tasks over without semphore control. What would happen? It depends! But quite possible that one ore more schedulers will suffer from thread starvation. Let’s talk about them later.